Take back all that cancer would try to take away. Here’s how. Swing a club, swing your partner; ride cross country or walk across town; cook for a cause or plank with a purpose–whatever your passion, put it in play for the survivors in your life. Step 2. Set up your fundraising page. Click here to set up your online fundraising hub. Once you set up your page, we’ll feature it here. Step 3. Need some inspiration? Here’s a look at some of the creative fundraising that has come our way in support of all who battle cancer. They started in Canada. They ended in Connecticut. In an athletic challenge of their own creation, a team of riders led by David Raymond rode 310 miles in 24 hours to raise funds for Mission (formerly the CT Challenge), combining their personal drive with a drive to give back to help cancer survivors of all ages. Like to bake? Nina Levine does and each year she sells these works of edible art to fundraise in support of her team riding in the marquee Mission bike fundraising event – the CT Challenge. Their passion is music, and giving back is their game. So it made perfect sense for businessmen by day Rob Fried and Jerry Vigorito to invent Band Together. 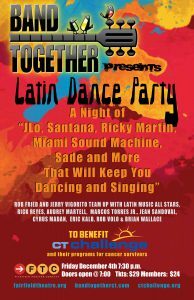 Through Band Together, these accomplished musicians bring together local talent with industry headliners to perform in ensembles covering a wide range of music genres to benefit charities that hit home with them, including Mission. Legendary football coach Vince Lombardi once said, “…stand and cheer for the doer, the achiever — the one who recognizes the challenges and does something about them.” Since our first meeting with Cindy and Rob Citrone and the Discovery team of supporters they bring with them, it’s been a standing ovation around here. 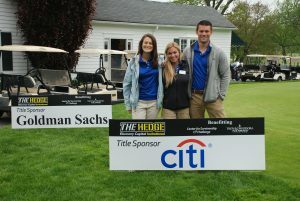 With its Hedge Invitational Golf Tournament in May 2015, of which Discovery made our game-changing Mission Training Center a beneficiary, and the Discovery Team that rides in the CT Challenge Charity Bike Ride in July, Discovery leads humbly from beyond the scenes with heart, authenticity and vision. 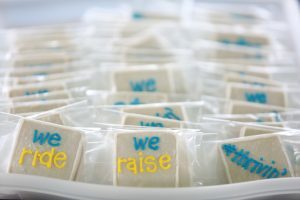 Their generosity for Mission (formerly known as CT Challenge) and the survivors it bridges back to life after cancer has raised the bar for all of us. 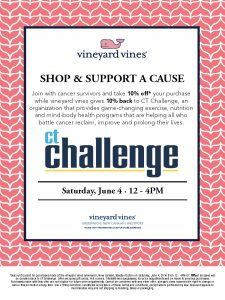 For three years running, Vineyard Vines has opened wide the doors of its Westport, New Canaan and Greenwich, Connecticut stores on a weekend day in June, donating a portion of sales to Mission. 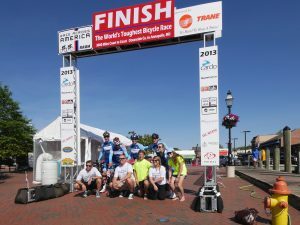 Held in conjunction with National Cancer Survivors Day, their support helped fund a team riding in the marquee Mission bike fundraising event – the CT Challenge. These crazies took their passion for endurance sports, cycling and the cancer fighters in their lives to an extreme when they biked across America as participants in Race Across America (RAAM), one of the most respected and longest running ultra-endurance events in the world, to fund a custom research project for Mission (formerly CT Challenge). 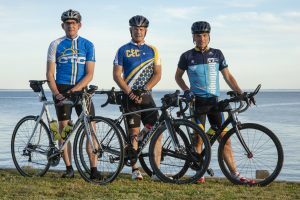 The four-man team of Tom Kottler, Adam Pemberton, John Ragland and Andy Pemberton covered 3,000 miles from California to Maryland in seven straight days of cycling. Riding in two-man, seven-hour intervals, riders switched every 30 minutes. Supported by a hardy crew of five who proved a profound mettle of their own keeping the foursome fueled and moving as they rode non-stop, the team raised $82,908 and came in 4th out of 17 four-person teams.